There's a lot of talk right now about passing new gun regulation reforms, i.e., gun control. We have to be careful about how these issues are approached. Some even within our community are okay with some of these so-called “common sense” laws. We have heard people say, “What are you so afraid of? 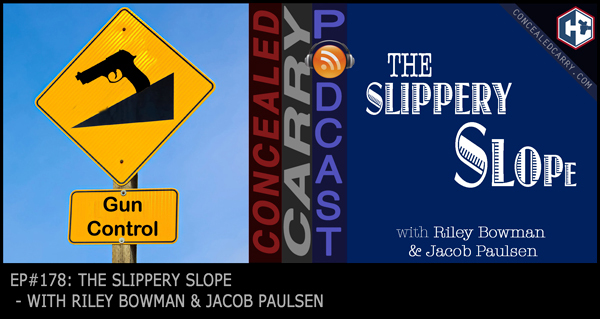 We're not trying to take away your guns!” Today in this episode we break down why this line of thinking can be dangerous and how you can approach the issue with friends, colleagues and even family that dare venture down the slippery slope. Press ‘PLAY' to listen now! National Concealed Carry Reciprocity Bill Finally Heading to Congress for a Vote! Is there a documented case where a gunman could only be taken when he stopped shooting? Let’s say a gunman is flanked. Does anyone say, “We should wait until he empties his magazine into the crowd before we fire. We don’t want to interrupt him.”? It is a myth that police must wait for a gunman to reload before returning fire. They are not waiting for a break in the action that only lasts two seconds. Mass shootings are not on a Take-Turns basis because it is very nearly impossible to know the difference between a pause between rounds and a reload. Have the shot? Take the shot. Magazine capacity plays little part in mass shootings. Leave a Reply to Ron in Napa Click here to cancel reply.